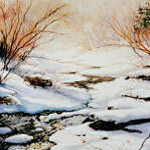 Inquire about the availability of an original winter landscape painting, a price for ordering a painting of a favorite winter scene in your personal photograph collection or the commission of a winter painting for your fundraising project. 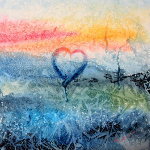 Your painting will be painted personally and with sensitivity by artist Hanne Lore Koehler. Satisfaction guaranteed. We deliver worldwide. International clients welcome! 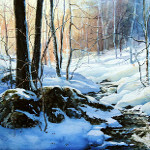 Shop for North American winter landscape paintings direct from artist and save on gallery markup. 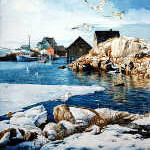 Purchase unique art for your clients including dining room art, living room art, great room paintings, family room paintings, art for executive offices and boardroom art direct from artist at wholesale art prices. 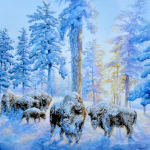 A Canadian Artist can't help but be influenced by Canada's climate. As each new season interprets its own version of the landscape, defining seemingly endless varieties of terrain in breathtaking beauty, I too feel compelled to paint my rendition of the spectacle. 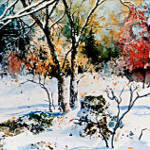 The arrival of the first snowfall of the season which, in our neck of the woods (Southern Ontario) usually occurs in Autumn, is greeted with mixed emotion by North Americans. Of course, kids and those who are kids at heart, can't wait to dig in and make snowballs and break out the toboggans, saucers, skis and various other required equipment for winter downhill travel. Such excitement for the arrival of a new season is felt by almost everyone and a comment on the event is always readily offered. 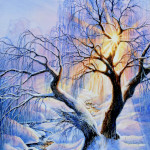 I love winter. 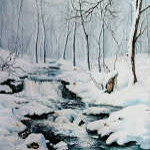 To me, the silent serenity of a gurgling winter creek scene translates to a feeling of inner peace. The pristine beauty after a fresh snowfall that blankets the rolling hills and clings to heavily-laden pine and spruce trees in Ontario is awe-inspiring. Short days and long nights define Canadian winters and when the sun actually graces the brief daylight hours, it is an irresistible attraction. Evening comes early during winter months in Canada. 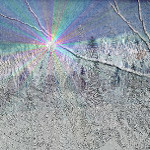 The distant sun is low in the sky all day and by four o'clock, the long evening shadows criss-cross the frozen landscape in intriguing patterns. 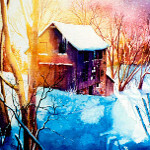 A crisp winter sunset behind a winter-weary back-country barn is a favorite subject of mine to paint. In the glow of the faint winter sun, the warm tones of a weathered old barn that stands guard over a snowy valley contrast the icy chill of winter. 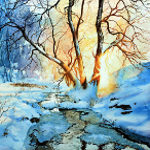 A luminous sunset can make winter white explode into glorious color. By mid-winter, the novelty of the snow has worn off and many Canadians dream of escaping winter's fury to some warm Southern climate - the Carribean or Southern United States; some of us "snowbirds" are lucky enough to actually go. Yet, there are some of us who find beauty and serenity right here. We prefer a Rockies skiing vacation. 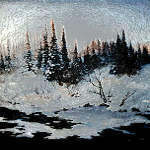 The amazing breath-taking vistas viewed from the summits of Lake Louise, Kimberly, Fairmont and Panorama in British Columbia are unsurpassed and the basis for many of my paintings. The term "Winter Break" has different meanings and conjures up different images to different people. Yes, my husband and I went South for a winter vacation - to the northern United States. According to our friends, we missed our destination and landed short by a few thousand miles. 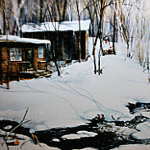 They thought we were crazy when we opted for the serenity and solitude offered by a winter cabin in Maine. The promise of cuddling by a cozy fire sounds like heaven. 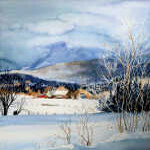 The tranquil sunny winter landscapes of the Adirondacks, Stowe Valley, Vermont and Maine were the basis for many of my vibrant and colorful winter paintings of the northern United States."